Wisconsin's U.S. senators showed differing reactions Tuesday to President Donald Trump's nomination of Judge Brett Kavanaugh to the U.S. Supreme Court. On a conference call with reporters, Republican Sen. Ron Johnson said he will review Kavanaugh's record before making a decision about voting to confirm him, but he said "early indications are very favorable." "Take a look at Judge Kavanaugh's record — really take a look at how he has been faithful to the text of the law," Johnson said. "That's the role of a judge." Johnson said he doesn't want a judge who tries to be a "super legislator," who looks to change laws instead of interpreting or applying them. He cited Kavanaugh’s statement that "text matters" as evidence the judge would exhibit that judicial philosophy. Democratic U.S. Sen. Tammy Baldwin hasn't yet weighed in on Kavanaugh's qualifications. Instead, she released a statement Monday night saying she is reviewing his positions on things like abortion and parts of the Affordable Care Act. "People need an independent justice who will not overturn the law of the land on women’s health, health care for people with pre-existing conditions, and the constitutional rights and freedoms of all Americans," Baldwin said in the prepared statement. "The stakes are very high for the American people and these are the things that I will be looking for as I review the nomination." Both GOP senate candidates who are running to challenge Baldwin in the fall, state Sen. Leah Vukmir and former Marine Kevin Nicholson, have expressed support for Trump's pick. "I will reliably support candidates for the Supreme Court who are Originalists, and who understand that our Constitution is fundamentally a pro-life document," Nicholson said in a prepared statement. 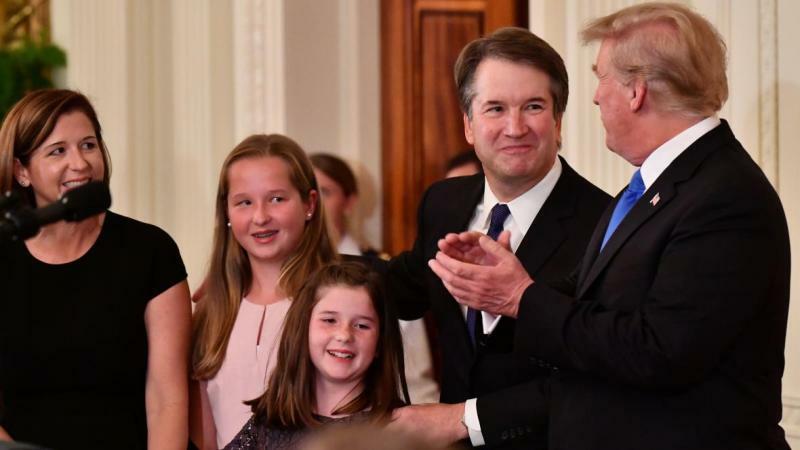 "The best predictor of future behavior is past behavior, and @POTUS's #SCOTUSPick, Judge Brett Kavanaugh has the track record to become a strong constitutionalist justice," Vukmir tweeted. Johnson said he expects Kavanaugh’s confirmation vote to happen before November’s election. He rebuffed attempts to liken the vote to 2016's conflict over former President Barack Obama nominee Merrick Garland. "We were going to let the American people decide who the president was, the composition of the Senate, and by virtue of those decisions what the composition of the Supreme Court was going to be," Johnson said of 2016. Johnson pointed out Trump will still be in office and in the position to make subsequent judicial appointments after November’s election, so the 2016 argument doesn’t apply in this case. Jonson also said Russian interference in the 2016 election has been overblown, arguing there are much larger threats to the U.S. than Russian meddling in elections. "Let's not blow these things out of proportion — this is not the greatest threat to our democracy, but I understand how members on the other side of the aisle would like to blow it out of proportion for political purposes," he said. Johnson, who traveled to Russia last week to meet with officials there, said Democrats have exaggerated the importance of Russian hacking because they didn't like the outcome of the 2016 election. Johnson said it's important for U.S. politicians to have an open dialogue with Russia because it is a nuclear power and interpersonal connections will encourage cooperation between the two countries. Editor's note: This story was updated at 3:30 p.m. Tuesday, July 10, 2018, with original reporting from WPR.